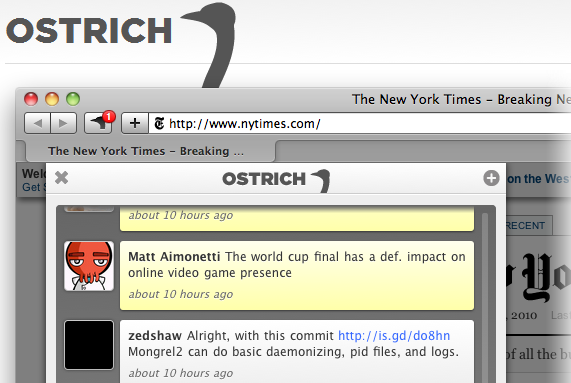 Safari's first Twitter app, Ostrich, puts slick and simple into the forefront. Safari’s first Twitter app, Ostrich, puts slick and simple into the forefront. We all have our favorite clients, but for some of us Twitter’s usefulness comes down to accessability. In this regard, it’s going to be hard to beat Ostrich. As @Zee puts it “it’s slick, but basic”, and that is likely the biggest selling point. Ostrich is the first built-in Twitter client that is designed solely to give you Twitter access no matter where you’re surfing on Safari. Yes, it is only for Safari. I loaded up Ostrich from the site, and gave it some time to load my Tweets. Once loaded, you just click on the Ostrich head and your Twitter feed will pull up. You can add new tweets by clicking on the +, and there’s a button to attach a link to whatever page you’re on. Of course you can also reply and retweet within Ostrich as well. As a Windows user, I can tell you first hand that Ostrich runs very well under Windows 7. I can only imagine that it would be equally as slick under OS X. While it’s obviously not the most full-featured Twitter application you’ll ever use, it’s probably not meant to be. But for basic features, in a really handy location, Ostrich is an awesome choice. Well done, Ostrich. Well done indeed. Read next: Want to email files to your Dropbox? Send to Dropbox does just that.